In the previous part of this series, I left with a chart of the Mac unit sales over the last few years, contrasting those units sold into the existing installed base as replacement Macs, and those representing new users adopting the Mac platform. I'll begin this post with a similar chart, this time spanning a few more years back, and smoothing out the quarterly data through the use of a trailing 4-quarters window to compute the values charted. Also, I've included a couple years worth of estimates into the future (period denoted in gray) after a reader's request. Check it out (click to enlarge). It's clear from this chart that the slow 5-year life cycle of traditional PCs, combined with the practically unlimited potential for expansion into the billion-and-a-half units within the overall PC installed base, precludes us from modeling any significant slowdown in the rate of adoption for Macs within the next few years. Perhaps only after a significant slowdown in wider PC adoption (currently at over 100m new users per year), and when Mac adoption surpasses 50% share of those new-to-PCs users (currently around 11%), one might consider an inflection in the incremental adoption of Macs (explore the charts on the previous posts to contextualize these two opposing trends). To clarify, that would not be the saturation point of the Mac installed base, the upper limit or "carrying capacity," where Mac adoption would stop or perhaps stagnate at a rate comparable to population growth, but the moment when new additions to the installed base begin to decline, i.e. the top of that bell-shaped curve, the mid-point of adoption in which the installed base merely has reached half (in the case of a logistic curve) or maybe even a third (1/e ≈ 37% in the case of the skewed Gompertz curve) of the eventual saturation limit. If we assume that for the overall PC market that inflection was signaled by the "double top" in adoption in 2008 and 2010, and depending on how quick the disruption of traditional PCs by tablets plays out, we might not get the "mid-point" Mac inflection until 4-5 years from now, with several more years, perhaps even decades of continued but slowing expansion after that (unless that old form factor gets radically disrupted in which case we'd get declines in the installed base, see the next section on iPod for an example of this). Given this long lifecycle of 5 years, the installed base can continue to expand for several years even under Y/Y sales declines. Such a long-term extension of the model, with those conservative assumptions, results in a saturation level (less than 2% Y/Y unit sales growth) for the Mac installed base of about 217m users, or about 3.5 times its current size, by the end of 2019 (remember it keeps expanding from there although minimally). I don't expect the broader PC market to expand much more from the current levels (maybe add another 300-400m users), allowing the Mac to reach a worldwide installed base share of about 11-13%, quite an ordinary range when compared to the current worldwide shares in the teens from HP, Lenovo, and even Dell at 12%. I would hardly characterize that as an ambitious projection (it does imply some significant penetration into the enterprise market). 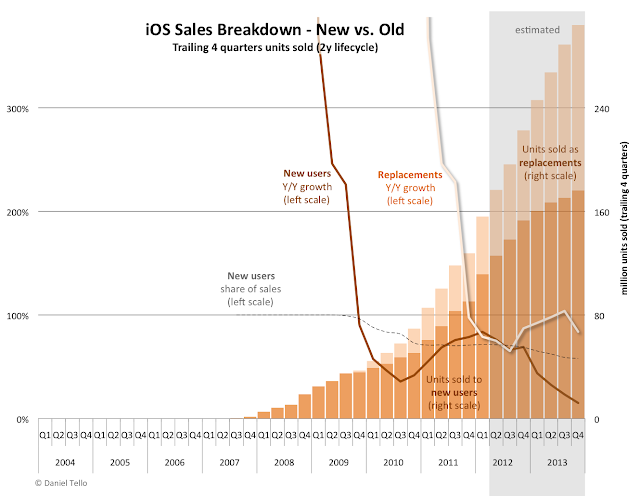 Beyond this rich, long-term history of Mac adoption, I'll now explore the incipient adoption dynamics for the new mobile computing devices (iPod, iPhone and iPad). To create a consistent presentation framework I'll use the same chart template as the one above. The iPod sales data provides the most varied adoption cycle dynamics, from slow incipient growth to exponential acceleration, deceleration, then quick saturation and even "negative" adoption or defection (declines in the installed base). As a whole it presents an ideal case study into these mostly empirical patterns we are considering as examples of the generalized theory of diffusion leading to saturation in technology adoption. The typical bell curve shows up beautifully (except for a slightly deformed right side), and the sigmoid shape appears twice, as a first phase of adoption followed by a second phase of declines, making the cyclic nature of adoption and disruption of a particular tech innovation quite evident. Here's the chart (click to enlarge). I love this chart. Notice first the vertical scale going more than twice as high as the Mac version, showing how the iPod was able to break free from the constraints of the Mac's measly installed base, with volumes obviously implying significant penetration of mainstream computing. It established a beachhead that, despite its niche application as a digital music player, gave Apple a critically needed, and even privileged, place in the minds of users with increasing mobile computing aspirations. Given its single niche application within personal computing rather than a platform for any number of mobile computing solutions (although it did become a kind of platform for myriad accessories through the iPod dock connector, which the iPhone and iPad also inherited), it expectedly reached an inflection point in adoption by 2007, soon after the exponential growth of the 2 previous years. After that it continued expanding while the replacement phase kicked in, and by the end of 2009 reached saturation. We might hypothesize that if there hadn't been an iPhone (and later iPad) displacing it, the light orange bars representing iPod replacements would have sustained that 55m yearly unit sales for a much longer time, the dipping red bars of defections would not be there, and the line charts of growth would be asymptotical to zero. But inevitably, along came the iPhone (and lesser feature phones before) to supplant its need. The increasing iPhone adoption, and then the iPad, is the main culprit for those red defection bars. 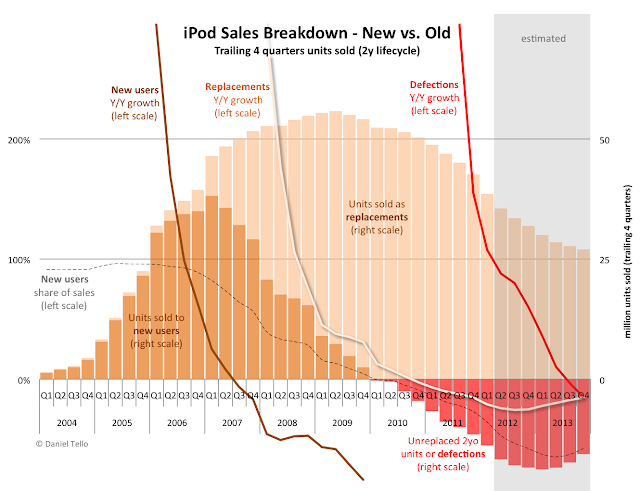 In the first fiscal quarter of 2009 (by the way the time scale along the horizontal axis aligns with fiscal periods with each fiscal year ending in September) the iPhone surpassed the iPod in new user adoption (yet not in sales volume) and from then on it was clear, given the iPhone momentum, that the iPod would see continued declining sales for several years, at least until a new market equilibrium was established for the few specific jobs that the three stand-alone music player form factors (shuffle, nano and classic) could retain. The defections continue to grow for now, but the rate of growth is decelerating fast. I've projected another inflection point within the next year or two, in which the yearly defections begin to decline, aiming towards such an equilibrium a few more years into the future, and perhaps even positive (though minimal) growth once again. The justification for this lies within the true platform capabilities of the iPod touch, and its possible future repositioning as a VoIP communication device (as public WiFi access might allow), when the iPod touch adoption (projected to account for about 85% of all iPods sold by the end of FY2016) finally compensates for the trickling iPhone/iPad cannibalization of non-iOS iPods. Under this 2-year lifecycle methodology, the installed base of iPods peaked at 109 million users between June and September of 2009, and by last quarter it had declined to about 87 million. I'm projecting a new equilibrium (<2% Y/Y unit sales declines) at about 43 million users by the end of FY2017, this level mostly based on the estimated 22 million units sold for iPod touch for two consecutive years, indicating the installed base of touches may have also reached saturation and might itself be suffering from iPad cannibalization (touch installed base of near 37m projected at equilibrium). A repositioning of the iPod touch (or a new brand of iPod) as a VoIP communication device making use of (future) free and ubiquitous WiFi might reignite an expansion well beyond these equilibrium projections. Again, the iPod not only acted as a trojan horse into the non-Mac computers base, preparing and even subtly conditioning the previously non-Apple user base for the true post-pc mobile revolution sparked by the iPhone and iPad, but also acted as a trial run for Apple towards learning and successfully managing all the complex processes and moving parts needed not just to enter the mobile phone industry, but also bring along real computing to it. This includes some very valuable know-how, from operational aspects like managing the increasingly complex supply chain and ramping up and down beyond millions and millions of units, to much needed sales and distribution issues like dealing with new third-party retail channel relationships (and keeping their inventory in check), to strategic insights like, for example, extrapolating from the "platform" experiences on the iPod accessories the need to enable and cultivate the iOS developer community. Most insightfully for an analyst (and likely strategists within Apple as well), the dynamics of its adoption/disruption cycle constitutes a great study for the potential evolution of other product lines in the future as it exemplifies almost every possible aspect and outcome of the diffusion of innovations theory (except, so far, the possibility of total depletion of the installed base, complete obsolescence and discontinuation of the product line), and it will continue to provide insights in all of these matters. iPhone: The Billion-User Installed Base? The iPhone constitutes the single most influential product line for Apple in terms of revenues, gross margins, and of course profits. Wall Street analysts' 11% consensus EPS growth rate estimate for FY2013 necessarily implies almost saturation of iPhone sales by then, which in turn implies rapid deceleration of adoption in the lapse of a year or two, and the inflection point of fastest adoption most likely having occurred in the last quarter. This assumption, and its inevitable conclusion, is in stark conflict with recent data showing continued increasing iPhone adoption, even at an accelerating rate in the last year or two. However, I have tried to accommodate a very conservative view in which the inflection point (maximum yearly adoption) does occur by the end of FY2013 (the accelerating Y/Y growth rate suggests otherwise). The shape of the resulting bell curve is a little odd, the bump seems a little compressed when compared to the thickness of its left tail, and the relative Y/Y growth chart line shows a rather abrupt and arbitrary peak for the last quarter. A more gradual plateau and slight deceleration in this line would be the more sensible projection, although sharp turns in the Y/Y growth rates have in fact occurred as seen, for example, in the first chart for Mac by the end of FY2008 under a recessionary macro-economic environment. So here's the iPhone chart including such a conservative projection for the next couple of years (click to enlarge). Again, notice the right scale going more than twice as high as the iPod chart (which was more than twice as the Mac). And notice the top light orange bars are still increasing considerably by the end of 2013, despite the dark bars reaching the inflection point. The symmetrical (logistic) expectation would be to at least double the height once more before saturation ensues. I'd like to be completely clear: the slowing growth pattern on the right highlighted in gray is in no means implied by the historical pattern to the left up to the last quarter reported (FQ1 2012). Since relative growth itself has been accelerating recently (more than exponential growth), there's no possible way to infer an inflection point yet, much less a saturation level (carrying capacity) for the iPhone. Nevertheless one might infer it, rather arbitrarily, from other external data points like the size of overall mobile phone install base, or the size and speed of adoption of the smartphone installed base and its penetration against the former, and finally a guess on the share of this market that Apple might eventually command upon saturation. The particular projection above is my attempt of being as conservative as possible while retaining a roughly bell-shaped curve for the dark orange bars (yearly new user adoption) as indicated by the diffusion theory. Asymco's Horace Dediu has created some amazing log charts about the "race to a billion users" (see here, here and here). In those charts he approximates users by the cumulative units sold, disregarding any notion of replacement modeling, in contrast to the main idea for user base modeling in my analysis here. However, more recently he himself has noted that for the most recent quarter, replacements probably account for 63% of iPhone sales in the US. One billion actual iPhone users (or subs if you will) is certainly not out of the question at some point in time given the latest estimate of almost 6 billion worldwide mobile cellular subscribers as of 2011. Many believe all of those subs will eventually become smartphone users, and assigning a 20% share of smarthphones (thus all handsets from the previous premise) to Apple is a no-brainer. However, I have some reservations regarding the definition of "smartphone" in that scenario, and Apple's participation on all segments of the whole worldwide market if that scenario did in fact became reality. In my opinion there will always be some percentage of subs that don't require a smartphone, only voice. Also, as mentioned in the iPod section, some percentage of usage could migrate to VoIP thanks to free, ubiquitous, roaming WiFi access points, eventually resulting in cellular subs cancelations. Finally, I don't think Apple is either ready or eager to take on the cheap, and extremely cheap, pre-paid subs like those prevalent in many parts of the developing world, which currently account for the majority of the active subscriber base. The projection shown above, extended far into the future, yields an iPhone installed base reaching saturation (<2% Y/Y unit sales growth) at about 630 million (320m annual iPhone units sold) by the beginning of FY2020, about 6 years after the inflection point in the end of FY2013, which is roughly symmetrical to the 6 years of increasing adoption from 2007 until that inflection. This, again, is the most conservative I'm willing to be given the trajectory up to now and what I expect about overall smartphone adoption. A more realistic conservativeness would put the saturation at 800-900m users perhaps happening a few years further into the next decade. Certainly something could come up to disrupt the iPhone trajectory, but if that were the case I would bet Apple itself would be participating in such a disruption, so trying to bake in any of that in the model becomes a futile and worthless guessing game of arbitrary what-ifs, and predicting disruption is pretty tough. There's very little history of iPad sales, as we're only now approaching the 2-year anniversary of the original launch. Therefore not only we do not have any replacement data to filter out yet, we don't have a clear trend of the Y/Y growth rates, given it can only be computed for the last 3 data points. Further, the first few points of Y/Y growth rate over a trailing 4-quarter window timeframe are distorted by non-comparable periods (the first quarter worth of sales is just one quarter, yet its trailing 4 quarters is compared to sales over the following 4 quarters even though it still represents sales over just one quarter). The incipient, though fast, adoption makes any educated guess of the projection much more uncertain. As with the iPhone, in order to approximate Wall Street's ridiculous consensus EPS growth estimate for FY2013, I'll try to project an immediate slowdown (but without it looking too abrupt) in yearly new adoption of iPads, something that so far is not at all suggested by the straight up ramp in adoption over the few quarters of history we have up to now, but it wouldn't be completely unprecedented either (see above how iPod adoption slowed considerably right after the hyper-exponential growth up to FQ1 2006). Here's the chart with the very short history and such a conservative projection (click to enlarge). Once again notice the right scale, now back to half of the iPhone range, and a bit higher than the iPod (which included iPod's maximum sales level, while this clearly would need to expand much further to fit the eventual maximum for iPad). Because of the quick, almost straight up initial ramp and the early inflection within 4 years after lanch, this shape suggests to me more of a Gompertz-like curve. Remember, for Gompertz the bell-shaped curve was skewed to the right (the right tail lasts more than twice as the left) resulting in the inflection occurring at only 37% of the final saturation level instead of at half-way there for the logistic. Extending this very conservative projection far into the future results in user base saturation (<2% Y/Y unit sales growth) at about 400 million by FQ1 2021. At an annual unit sales volume of 200m, and traditional PCs selling at a 360m annual pace at equilibrium (1.8b user base upgrading every 5 years), for Tim Cook to be wrong (about tablets outselling PCs at some point) requires that iPad share of all tablets stays above 55%. Because this seems quite possible (see iPod market share), and because I highly doubt Tim would be wrong in his assertion, this tells me the projection above is too conservative and way more than 400m users will end up joining the iPad base. As a final exercise (phew enough of this post! ), here's a chart combining the iPod touch (estimated), iPhone and iPad adoption into the single iOS category. Doing this makes a lot of sense in order to estimate sales (and its growth limits) of apps, tunes, movies, iCloud related services, other software, and more, not only to make financial forecasts for Apple, but also to provide app developers and other content creators a ballpark idea about the size and growth potential of their Apple-based addressable market. So here's that chart (click to enlarge). Notice the vertical scale goes about 60% higher than for iPhone, and it would need to double again to fit the whole diffusion cycle. 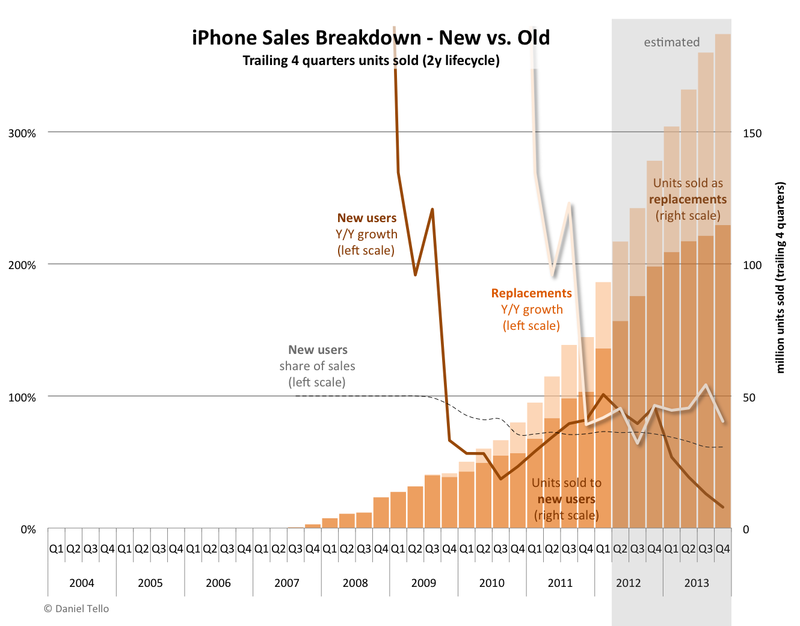 It mostly resembles the iPhone chart, with the growth line charts looking a bit smoother. Extending the projection far into the long-term future, we get near saturation (<2% Y/Y unit sales growth) by the end of FY2020 at well over a billion iOS devices in use. Thanks Daniel. It's very exciting to watch Apple grow and read your analysis. Thanks for quoting Britney Spears. Made me laugh. Long term matters a whole lot, but I'm glad you cut off the projections before they could dominate the visuals. There are a LOT of issues around substitutions — e.g., whether biz types who love iPads might go for WinSlates — and straight-up competition — esp the increasingly hardball patent litigations — that would require some huge confidence bands around the numbers. But the most curious thing to me is your oh-so-conservative baseline number for short-term iPhone and iPad growth. Per your insights above, Apple has been building out its infrastructure in China. Looks to me that in a quarter or two, US share of iPhones could fall from ~ 35% to ~25% in the best possible way: an explosion of new international users. 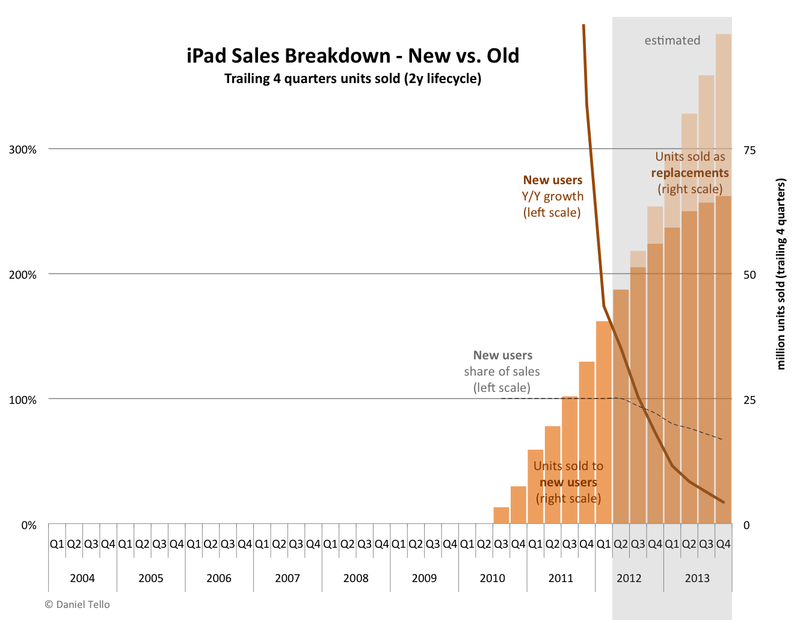 And regardless of whether recent rumors are correct, an upgraded iPad would seem inevitable, and with it, another huge explosion or replacements atop a “fast as they can make 'em” new user curve. Or am I misunderstanding the charts' Trailing 4Q feature? If you showed Quarterly at Annual Rate, would your data show this? Thanks Walt. I agree with the uncertainty aspect, which is why I try to remain on the conservative side. I believe what you're seeing for the upcoming iPad upgrade cycle is not only the smoothing effect of the trailing 4 quarters aggregation (which for the initial points does give some inconsistent comparisons), but also the strict enforcement of the 2-year lifecycle condition for upgrades. Under this simple replacement rule, only those units sold precisely two years earlier get to be upgraded if there's enough sales in the current period. If there's not enough sales to cover the 2-year-old sales then you get declines in the installed base as in the iPod case. So for the iPad upcoming upgrades, by the end of this quarter there will be zero iPads that are 2 years old. By the end of next quarter in June, there will be exactly 3.27 million (sold in 3Q2010) units that are 2 years old, and thus all of them will get replaced because Apple will sell way more than that, and the excess is categorized as new users. So, you see the total height of the bar for the current quarter (2Q2012) at about 47m units, that is for the trailing 4 quarters up to March, which implies about 11m for this quarter alone. There are no replacements being modeled since every single iPad bought up to March is less than 2 years old. Then you get to the next stack combined height at a little over 54m over the trailing 4 quarters up to June, which implies about 17m for the June quarter alone. Of those 54m, only the 3.27m that became 2yo are up for replacement, thus you get the slightly over 50m in new users over the 4 quarters up to June. Notice then you're seeing a comparison of 4 quarters worth of new users and only one quarter worth of upgrades stacked on top, when the true quarterly comparison of new vs. replacements is actually about 14m new vs. 3m replacements. Give it another year and the comparisons become consistent being all annualized replacements: 1 year worth of sales from 2 years prior against 1 year worth of current (ttm) sales. Of course, in reality much more than 3m iPad users will actually upgrade by June, just as many original iPads were upgraded to iPad2 regardless of them not being "old enough". But then you have some others who wont upgrade after 2.5 years or 3 years. Over the long term, the true average lifecycle would come through the data (simply divide the estimated installed base by the estimated annual replacements in the following year and you get the implied average lifecycle) and then one could consider recalibrating the simple 2y assumption if needed. As described in part 2, this is quite a simplified rule for modeling upgrades and installed base size, but it's still quite useful particularly over longer periods of time. I wanted to keep things simple. Those are incredible charts! Works of art. I do think I’m missing something however. What is the source of the ‘new’ user data? I have always thought that each quarter new users make up about 50% of the sales. 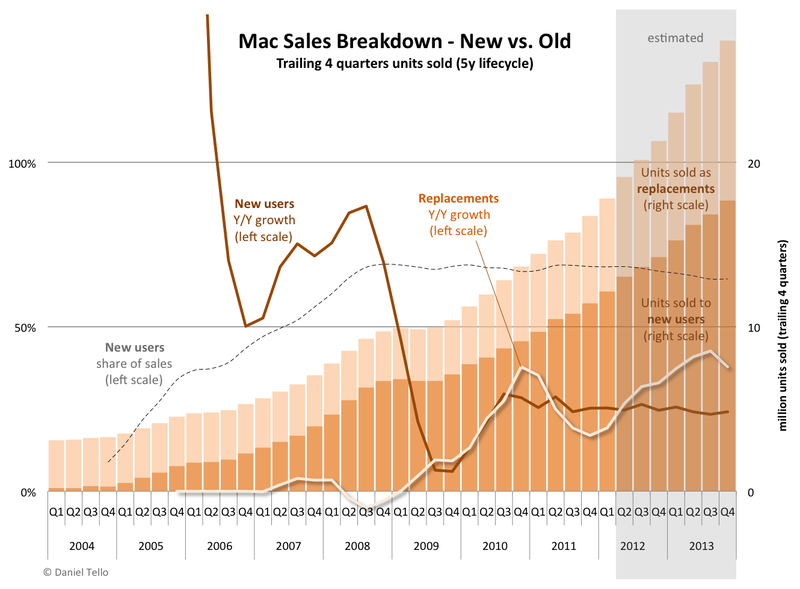 Yet, when I look at your stacked bars, I see a far greater proportion of Macs sales coming from new users? Thanks for the explanation. I love the analysis. I would love to see simpler charts, based on complex data. Very tough request, I realize. You've probably seen this, but here is an example. Daniel, this is utterly fantastic work you have done here - worth every minute you put into it. There are people like me who appreciate this kind of analysis more than we can express, people who are just as into it as you are, but lack your analytical skills. Great analysis. Seems like using a log scale would be more revealing. Anon #1, the 'new' user data is directly derived from the sales data and the 5y life cycle rule: the sales from 5 years ago (or 2 years for iOS or adjust with your own) get flagged as replacements, and any excess in the current quarter (or deficit) is flagged as 'new' (or defections) i.e. just subtract the 5-yr old sales from the current sales. That is of course a very simple rule, but the resulting estimate doesn't contradict what Apple has always said, that they get more than 50% new-to-Mac in their retail stores (I'm getting mid 67-68%). The reason it may come out lower in Apple's survey data could be that kids who've originally received hand-me-down Macs from their parents or older siblings and later go to a store and upgrade wouldn't characterize themselves as new-to-Mac when the store employee asks them, but under this model, that being their first direct purchase indeed makes them a new user. Unknown, I do try to keep them simple, but yes I sometimes tend to overlay too much on the same chart. There's not much complex data in Apple's financial reports. Perhaps you might like this one from about a year ago? Anon #2, thanks for the appreciative words. Glad you like it. Anon #3, yes log scale can reveal some things but can hide other things, the patterns are just different and require extra attention to interpret correctly. Some people do get confused with the extra layer of abstraction. I mainly went with linear scale to show the bell and sigmoid patterns as described in part 1. Once again, I am in awe of your work. Not only is it telling of Apple's massive future growth, it is so obviously low-balled by the beyond-reasonable-low estimated consensus estimates, which you so obligingly employed. Your closing comment, of your own conservative 2013 estimated growth rate of 3# TIMES the street's consensus, leads to growth that boggles the mind. If I were but young again, I'd be urged to have almost all my holdings in AAPL, while reminding Britney that the cause of most growth spurts is stimulating experience! What do you think about the Law of Large Numbers? Seems like everyone is trying to get press by putting Apple down these days. Jack, I'm sure you saw my comment about the so called LOL numbers in part 1. Daniel... my apologies. You are correct in your comments. You see I first read about LOL in part 1 of your blog and then I read several other articles by other authors during that period. By the time I read part 2 I had forgotten about first reading about LOL in your part 1 blog. Oh, the aging brain is a terrible thing. Personally I can't see anything stopping Apple for a long time. The new ipad launch has generated initial numbers that are off the charts pushing back pre-orders. We'll see new thinner Macbooks, iphone 5, possibly new MacPros all this year. I can only see another amazing year of growth. Amazing oeuvre. Many may have the instinctual notion that Apple is many years away from slowing down, but here you have provided statistical proof. Now stop teasing us and give us your fair share price estimate for the next 5 years. We know the market will lag 2 to 5 years behind the fair value, but eventually will get there. The biggest disruptive threat I see is the antimonopoly busybodies in US/Euroland forcing a break up of the company, and not understanding that the company is OSX/iOS. Daniel, amazing work. I learned a lot from the three parts. One question. Let us assume 1 Billion iOS devices as the top of the S curve. Can I then assume that 500 Million as the mid point of the first derivative bell curve? If so, we are currently at 300 million. In 18 months they can reach 500 Million. Does that then point to the peak growth point for iOS? That's correct if you assume the bell curve is symmetrical (e.g. logistic or gaussian). If instead it ends up looking like the right-skewed Gompertz curve, then the peak additions to the iOS installed base would occur at around 368 million (1 billion/e). Which one fits iOS adoption better, Gompertz or Gausssian? More than just theoretical, that inflection point may also signify as a point of (approx) the maximum P/E ratio for Apple before it starts a steady contraction to 12. In my mind that 12 will be the PE when the growth curve reaches the right most point. Ok there's a few assumptions in your reasoning that need to be made explicit, just to make sure we're clear on your argument. This comment will be pretty long so apologies in advance. First, you assume the max P/E is tied to the max iOS adoption. This would imply that iOS adoption is the sole driver of earnings growth. It may be a very good approximation currently, but things can change. I would suggest that in the extreme hypothetical case that iOS reaches 100% of the world's population (zero or minimal adoption from then on), Mac OS X would not have reached even half, and most likely no more than 25% of the traditional PC worldwide installed base, and thus that could be an important growth potential to tap from even in the face of no growth from iOS. Obviously new product categories would be another source, and likely would have stronger needle-moving power than the old Mac line in reigniting growth after iOS saturation. Second, it's not the case that P/E expansion must go on as long as customer adoption rate is increasing, nor is it the case that the P/E ratio should start declining when adoption slows down. Curiously, for all of 2010 and 2011 there was PE compression despite accelerating iOS adoption and EPS growth rates. Most recently the P/E ratio has recovered just in time for a most likely deceleration of EPS y/y growth over the next couple of years. So the opposite of your assumption may seem to be the case? I don't know. Obviously other factors are in play. In my preferred approach there isn't any long-term consistent directionality in P/E in relation to increasing or slowing growth, but instead I assume that a 10 P/E (or use your 12 or any other that may best fit the data) is the fair long-term multiple when assuming some sustainable long-term EPS growth rate. Then any deviation from that "fair" multiple by the market, regardless of the current short-term growth cycle trend, would be an opportunity to adjust one's exposure to AAPL and benefit in the long term. One distinction that needs to be made is between the relative y/y growth rate and the annual incremental adoption (the derivative of the s-shaped curve). These are not the same, and neither would their peaks coincide. In fact for the simplest logistic and Gompertz theoretical models in my examples, the relative y/y growth rate is always declining, so the peak occurs at the very first growth point computed (the second year). There are more flexible theoretical generalizations of the logistic and Gompertz dynamics which allow for relative growth rates that expand for some time before declining, with a max rate of growth inflection. It turns out that this max rate of growth inflection moment always occurs before the inflection on the incremental adoptions (the derivative). In other words y/y growth rates for EPS or at least unit sales peaking might be taken as a warning of an impending inflection of adoption (though it may be avoided), which would in turn depress investor enthusiasm toward the stock, impacting the P/E ratio, all of it without any actual inflection in incremental adoption having occurred and possibly never occurring (for example avoided through an incremental product refresh that boosts the growth rate back to investors' expected levels). Third, under the methodology I've used in these 3 articles (strict 2yr replacement cycle, see other comments here for explanation) the iOS installed base as of Dec-2011 is 241.6m and not 300m. Still, it's quite likely that we get to a 350-400m installed base by the end of this year. So if we assume a $1b saturation capacity and a Gompertz curve then that's still a likely inflection within this year. However, the assumption that the max carrying capacity of iOS is 1b devices is enough to fix the max earnings extracted from such a saturated market, regardless of the shape of the curve to get there, and which similarly fixes the stock price given some P/E ratio. In other words, if you assume iOS saturation is 1b, and that implies zero EPS growth and a constant P/E from then on, then the stock price at that point would be the same regardless of Gompertz, logistic, or any other diffusion model used to get there. The only difference is that the slowdown in adoption for the Gompertz model is much more gradual than for the symmetrical logistic model. The time it takes to reach saturation after the inflection is 2 to 3 times as long as the time of increasing adoption up to the inflection. This may allow sufficient time to devise new product and/or service strategies to further monetize the still growing installed base after the inflection. Finally, consider the earnings power of commanding a huge installed base (even if saturated) which is conditioned into a frequent and loyal replacement cycle. Even if you're right about the stable P/E (at 12 or 10 or whichever figure the market decides to apply), such a loyal customer base would provide a practically unlimited flow of "E" into the P/E equation. If the share price were to remain constant, as your premise implies, that means all of the "E" would have to be distributed through dividends to prevent the cash balance from accumulating indefinitely and eventually surpassing the share price, which would be absurd. Having said all that, I'll try to illustrate the answer to your question by graphing some sensible fits to the historical iOS adoption data (perhaps I should've started with this). The biggest problem in choosing Gompertz or logistic or any other model to the data before the inflection has occurred is that it's practically impossible to differentiate between them until you're very close to the inflection, or already there. Here's an eyeball fit of the two curves for the iOS adoption data up to Dec-2011, assuming saturation at 1b for both (Gompertz in blue and logistic in red). The logistic fit finds the inflection in the middle of next year while the Gompertz finds it by the end of this year. Here the Gompertz curve is a better fit for those comparatively small differences observed up to 2009. If we relax the 1b max capacity constraint, and instead fix the inflection of both having already happened by the end of last year, then there's this possibility in which the final saturation for Gompertz is 657m (e*241.6) while for the logistic it's only 483m (2*241.6). As you can see by these two arbitrary examples, any number of decent fits can be found before or even a bit after the inflection point occurs. The reason for this is that up until shortly before the inflection all we see is simple exponential growth, and neither model can decisively discriminate out of it. Which means there's no reliable way to estimate the maximum saturated level of adoption, nor the real shape of the curve until after the inflection is observed. This fact gives away the flaw in any analyst's pretense in currently projecting a limited growth model solely from internal historical adoption data. And that's precisely why in my analysis I rely mostly on external market share penetration assumptions to inform the possible saturation levels of each product line, and arbitrarily aim inflections around the end of next year to try to entertain a bit of the pro analysts' collapsing growth predictions by then. Phew, that sure was a mouthful! Hope it helped. Daniel, what can I say, just awesome. Quite thrilled that you took the time to write a detailed response to my question. You did see through correctly a few things I had in mind when I asked that question. I understand what you are saying and that makes sense. Yes, it helped a lot. I will digest further and if I have any further questions/comments, I will post here. You can consider elevating the above three part comments as addendum to the main article. Thanks. Great reply to my query, Daniel. Excellent analysis and very helpful. Let me mull over this and digest. Thanks. "Here's an eyeball fit of the two curves for the iOS adoption data up to Dec-2011, assuming saturation at 1b for both"
Daniel, That is quite impressive. I have to learn to use WolframAlpha like that. Great work. In this little corner of the web, true innovative analysis is going on. Thanks Daniel. Just as a sidebar, I saw some growth curves for Amazon. My first reaction is,"Ah..tehre is an S curve"! !